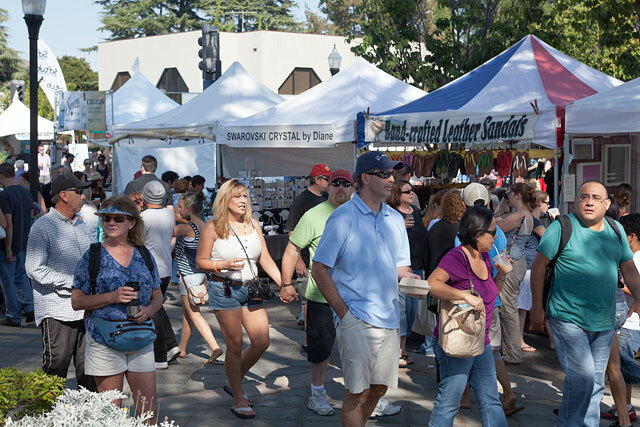 The Mountain View Art and Wine Festival, September 7th and 8th, 2013, is said to be the highlight of the festival season in the South Bay area. Running for its 42nd year, the 2013 event is set to be better than ever – Salsa Sunday is a new addition to the program this time, but of course the ample food, drink and celebration remain unchanged. Established in 1971 as the first fundraising event for the Chamber of Commerce, the festival has grown since then to be an integral part of its annual campaign and has sponsored many Chamber programs helping the local community. More than 600 booths form the main body of the attraction to this event. The leading craftspeople and artists from across America congregate at the festival, bringing their work in media including glass, metal, leather, wood and fibers. Visitors can purchase practically anything, from vases, clocks and decorative homewares to jewelry, sculpture, paintings and photography. Even hats, handbags and footwear can be found, crafted by hand and therefore completely unique. In addition, nearly two dozen of the booths are worked by food vendors, ranging in flavors as diverse as barbeque and grills to Asian noodles – and, of course, a selection of sweet dishes too, with the traditional candy corns, crepes and ice creams as well as chocolate dipped fruit kebabs. The food areas on Castro Street are in the heart of the downtown area of Mountain View. For drinks, a similar level of diversity: ten wineries offering different varieties all hand selected by the committee, numerous beers from local and national breweries including the Tied House Cafe and Brewery, Mountain View’s own beer producer, who have made two unique brews especially for the festival weekend. Homemade lemonades, pomegranate, blueberry and coconut juice drinks will also be available across the festival. Those looking for places to stay around Mountain View CA will enjoy Salsa Sunday, a new addition to the entertainments program for the weekend. Thirteen big-name acts provide live music from a wide-ranging mixture of traditions. On Salsa Sunday, Orquesta Borinquen and Ruckatan Latin Tribe will be bringing their unique Latin sounds and encourage guests to dance the night away. Other acts present during the festival include Tennessee River, The Houserockers, Pinky Rideau & Blind Resistance and The Pacific Soul Band, all of whom will perform on the main stage. Elsewhere across the city, folk harpist Aryeh Frankfurter, Chapman stick player Bob Culbertson and the group Ancient Winds will perform more unusual cultural music. Previous PostLearn How Computers Came to Be at the Computer History MuseumNext PostSee an Upcoming Event at the Shoreline Amphitheater!